At The Plumbing Doc, our experts can repair and replace water lines, sewer lines, and gas lines without digging up the route the line takes. To do this, our highly skilled technician will need to determine the route of the pipeline with a camera inspection. After we have determined the source of the problem and diagnosed it, we will either utilize existing cleanouts or dig small holes to create an access point to the pipe. Depending on the size and type of line to be replaced, we will choose which type of our state-of-the-art trenchless line replacement equipment to use. On small lines like leaking water lines or sprinkler lines comprised of materials like PVC, we will recommend the static pull cable system. On medium sized lines or harder and rougher materials like galvanized water lines, our experts will recommend our trenchless line replacement process in conjunction with a compressed air piercing tool. 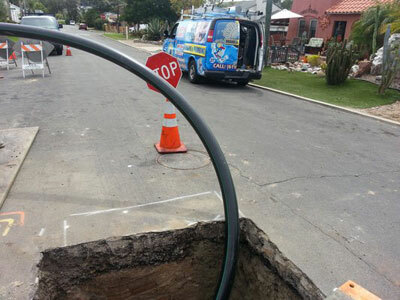 This state-of-the-art method of trenchless line replacement pulls a large tapered bursting head by a one inch cable through the old line which crushes to old line outward into the surrounding earth and at the same time pulls in a new HDPE SDR 17 or almost any other type of new line that our California residents job may require. Horizontal auger boring is truly an innovative alternative to trenching when it comes to utility installation. The trenchless horizontal auger boring method, sometimes also referred to as “boring and jacking,” is preferable in many casing to pipe ramming or pipe jacking methods. Advantages of HAB are that it eliminates damage to previously existing road or railroad embankments and requires limited traffic disruptions; therefore it is the preferred method for installing utility pipelines under roads, highways, or railroads. The HAB method is a very economical choice as well. HAB trenchless techniques can be used to install pipelines up to 72 inches in diameter in a cost-effective manner. Machines used to perform horizontal borings can be equipped with cutting heads to drill holes ranging from 8 to 80 inches in diameter. The first step in performing a HAB installation is to acquire a geotechnical site survey. This geotechnical site survey will provide necessary information about soil and groundwater conditions as well as expected obstructions and will allow the drilling company to effectively plan the HAB operation in cooperation with project engineers. Before installation begins, the site should also be cleared for underground utilities, something that is readily accomplished in most states by calling a “one-call” hotline. Next, the crew will prepare a drive pit at one end of the planned pipeline. This is where the crew will operate from during the boring. Then, a drilling machine is brought on site that includes lengths of auger, casing, and a cutting bit suited to the soil conditions at the site. During pipeline installation, drill cuttings exit the casing in the drive pit and can be excavated from there. Once the casing pipe is in place, the carrier pipe, or the pipeline being installed, can be pushed or pulled through the casing as it is assembled. Final steps of the installation include preparing as-built drawings, grouting voids created during drilling, and hook-up of the installed pipeline. Overall, HAB methods provide a great chance of success for difficult installation projects. When Is The Pipe Freezing Repair Process Recommended? Call The Plumbing Doc For No-Dig, Trenchless Repair & Replacement Services In California Today! Our team at The Plumbing Doc has the right equipment and highly trained professionals to do the job right the first time.